The new July 2015 edition of the magazine Eye-Ai contains a six page feature on Okinawa entitled ‘The Phantom Coast’. The article focuses on the southern coast of the island and its author Stephen Mansfield includes a few paragraphs about his interview with me last year. 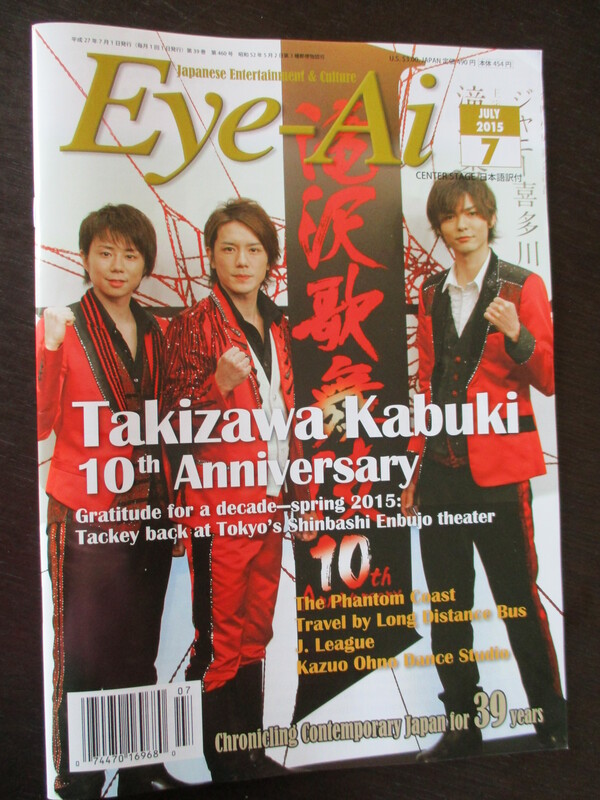 Eye-Ai is a magazine introducing ‘Japanese Entertainment and Culture’ and is also available outside Japan in Hawaii and California. “While I was in the war-scarred south I wanted to drop in on Englishman John Potter, an unlikely resident of this area. John lives in the coastal village of Odo, his two-story home, shared with his wife Midori, located on well-appointed slightly elevated ground with views of the East China Sea. “The house didn’t cost much” John confided: “Not everyone wants to live here. There are many bones still lying just below the surface of the earth.” The spirits of the dead are restless it seems, phantoms still haunting this coastline. 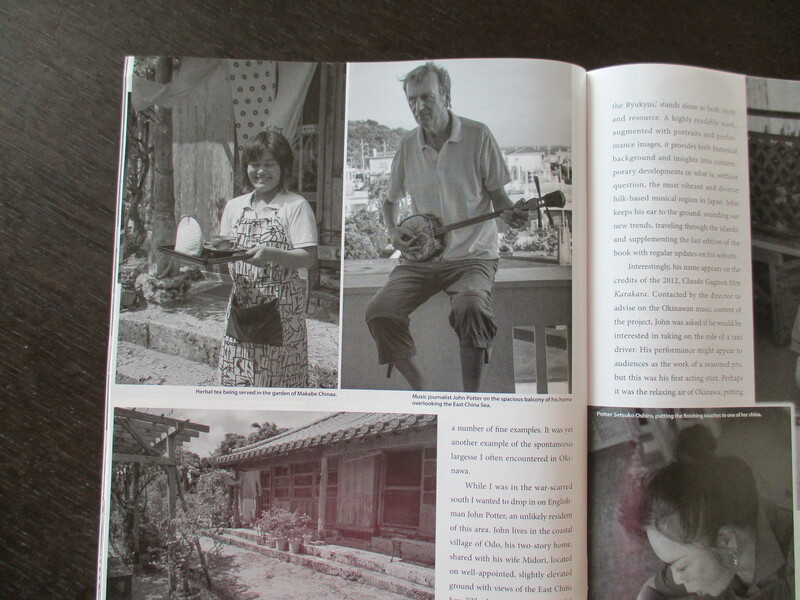 A journalist specializing in the indigenous music of the islands, his book, ‘The Power of Okinawa: Roots music from the Ryukyus’, stands alone as both study and resource. A highly readable work, augmented with portraits and performance images, it provides both historical background and insights into contemporary developments in what is, without question, the most vibrant and diverse folk-based musical region in Japan. John keeps his ear to the ground, sounding out new trends, traveling through the islands, and supplementing the last edition of the book with regular updates on his website. Interestingly, his name appears on the credits of the 2012, Claude Gagnon film Karakara. Contacted by the director to advise on the Okinawan music content of the project, John was asked if he would be interested in taking on the role of a taxi driver. His performance might appear to audiences as the work of a seasoned pro, but this was his first acting stint. Perhaps it was the relaxing air of Okinawa, putting people at their ease, that helped him breeze through the audition. One of the most pleasant places to relax in Okinawa is on residential balconies, which are often surprisingly deep and long. John’s balcony has become an extended living space, reading room and study, as well as an al fresco venue for meals. It was here that Midori served up an early, pre-sunset dinner, one enriched with local herbs and vegetables. I hope it isn’t too nitpicking to point out that the view at Odo is actually of the Pacific Ocean not the East China Sea. And the character I played in Karakara is not in fact a taxi driver, though much of my time on screen was spent driving a car! This entry was posted on June 3, 2015 at 4:41 pm and is filed under Feedback on the Book. You can subscribe via RSS 2.0 feed to this post's comments. You can comment below, or link to this permanent URL from your own site. Maybe not the right sea but a Nice! view of you,John. meantime, all the best to you and Midori. Thanks Joanna! All the best to you and yours as well.